So a Roman and two nuns walk into a wine barge. . .
Oh, no, no–this is a serious post about a day trip we took some weeks ago, and I’m just now getting around to writing this. 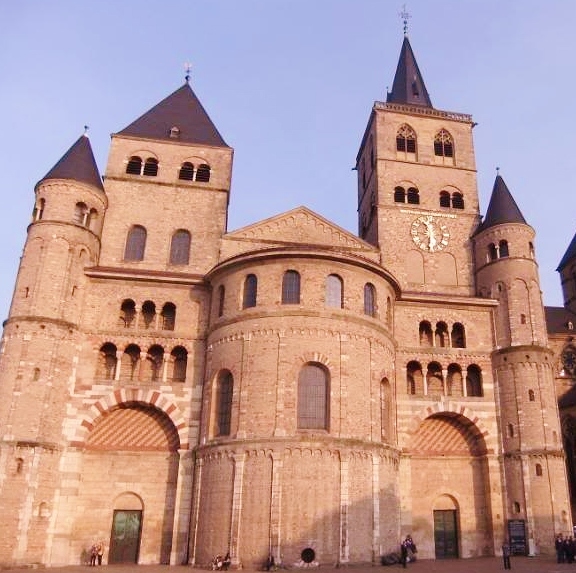 We loved the day we spent in Trier, and this fabulous city deserves a closer look than I’m giving you here, but I wanted to get some impressions down before they fade from my addled brain. I’ll focus on just a few things from our trip: the fact that Trier is an ancient Roman town (and plenty of its Roman heritage is still a vibrant part of daily life in the city), the beautiful churches and religious heritage here, and the wine culture that abounds in the region and town. The Wine Barge and its Rowers: We entered the pedestrian zone of the Town Center close by Weinstube Kesselstatt (a wine garden). Of course, I had to stop and take a photo. Not because the wine garden was picturesque, although it was. (And serene, as you might guess from my sleeping son in the foreground.) 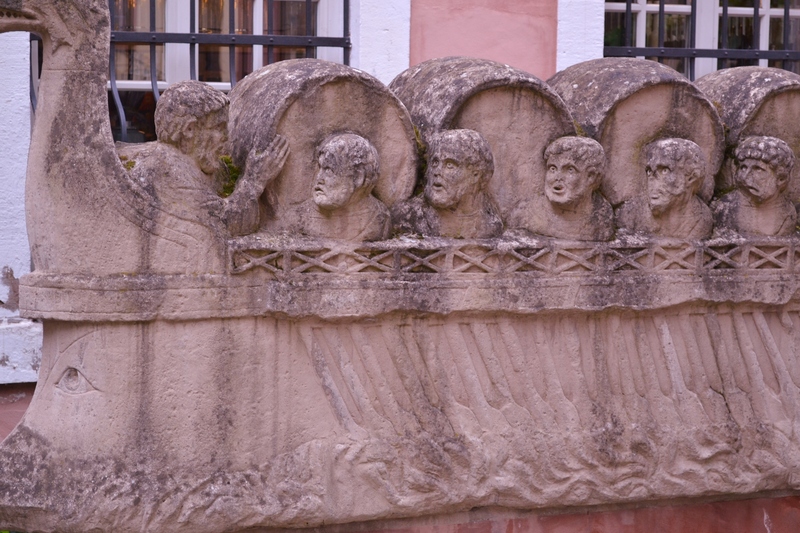 But because of the large Roman stone carving out front: a Roman barge loaded down with wine barrels and oarsmen. And, to be sure, these oarsmen should be breaking a sweat. The Romans planted vineyards along the Mosel and the Rhine to produce wine for their many garrisons. . .and production hasn’t stopped since. 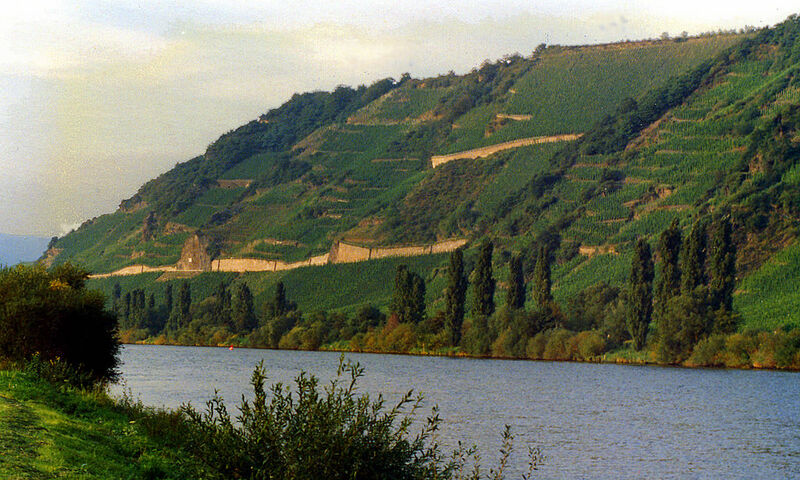 I’ve read somewhere that the Mosel region is Germany’s third largest wine producer, but first in terms of presitige. Reislings from this area are quite good! 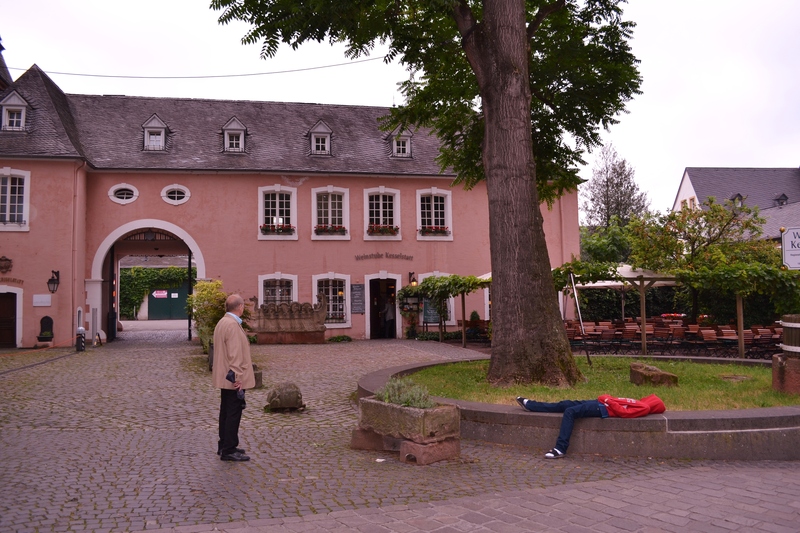 The wine country in the Mosel: As you drive toward Trier, you’ll wind through the lovely Mosel wine region. Both sides of the road and the river are flanked by vineyards. It’s absolutely beautiful country, and the trip would be worthwhile even if you did nothing but amble around and enjoy the scenery. I can’t offer much insight into the individual wineries here–I’ll have to research that on a more liesurely trip–but the drive is heaven! 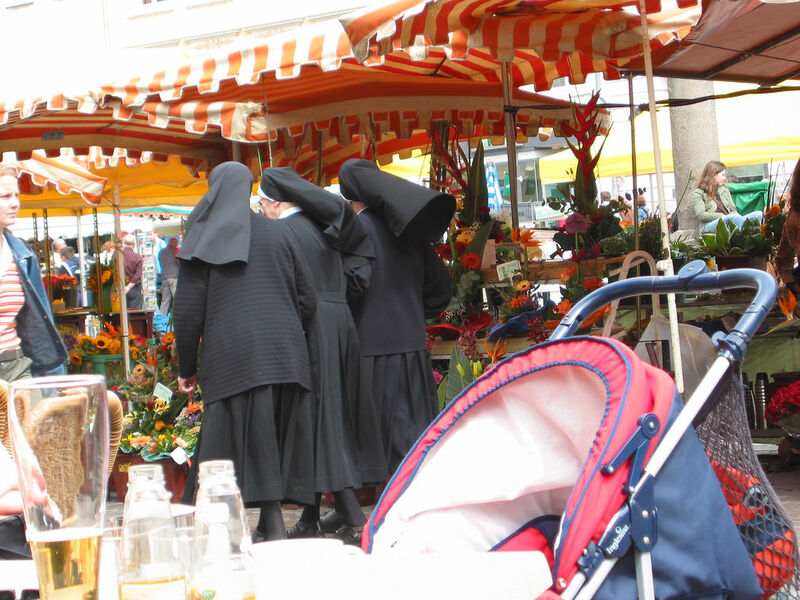 The Nuns: I’m sure that few people would consider a superfluity of nuns to be a tourist attraction. But they did add atmosphere, and more than a little gravitas, to the cathedral. Coupled with the fact that the cathedral was mostly closed off for a service when we were there, they also served as a reminder that we were visiting a living place, not just a tourist attraction or an historical artifact. That always breathes some life and enchantment into a place. The Cathedral and Chapel: Because there were services going on, I didn’t pull out my camera for many photos, but the Trierer Dom and the Liebfrauenkirche (Church of Our Lady) are exquisite, and boast the title of oldest cathedral in the country. It was built upon the foundations of an older Roman structure. The structure sits only a few blocks from the Roman basilica (the Aula Palatina–the old throne hall of the emperor), a structure that impresses by virtue of both size and beauty. But the cathedral seems larger and more beautiful still–I’m sure the Roman Emperors would roll over in their graves at that comparison. 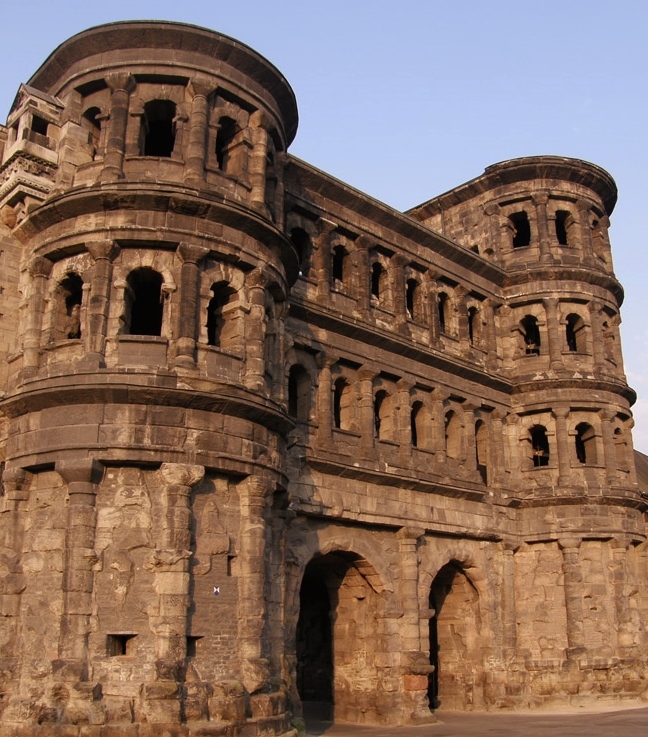 The Romans: If you Google Trier, one of the first things you discover is that it is an ancient Roman town–perhaps the oldest city in Germany. The Romans called the town Augusta Treverorum, and it was an important economic center–surely because of the river and a Roman road that came through the town (including a bridge over the Mosel). The most dramatic reminder of this history is the Porta Negra gate (photo below). It may no longer guard the city walls, but it’s certainly still a focal point for those who visit. Although my son knows a little Roman history–largely thanks to the British Horrible Histories series and its treatment of the Rotten Romans–he was more intrigued by his ability to find odd shapes and “pictures” in the walls of the stone structure than by the structure’s powerful mass, architectural prowess, or historical import. Puts those Rotten Romans in perspective, doesn’t it? Next > Calling All Foodies: I Need a Plum Recipe!! Looks like a beautiful city, hopefully you did some local wine sampling too! The picture of your sleeping son made me laugh – we have a large selection of our son in a horizontal position at various tourist sites and places of interest!! Yes, love the Reislings…although I’m more of a red wine fan in general.